The joint 49th session of the Board of Heads of Administrations of the Regional Commonwealth in the field of Communications (RCC) and 20th session of the Coordination Council for Informatization of the CIS member states attached to RCC took place on July 15-17 in Astana, Kazakhstan. Azerbaijan at the meetings was represented by a delegation led by Communications and High Technologies Minister Ali Abbasov, AzerTag state news agency reported. The event mulled issues of efficiency of communications, information, telecommunications and radio and TV networks in CIS countries, as well as regulating of internetworks problems in border areas. The Azerbaijani delegation attended the meetings, informed the participants about the ongoing reforms in the country, projects TASIM / EuraCA, preparedness of telecommunications networks for the first European Olympic Games to be held in Azerbaijan in 2015, and participated in the discussions. During the meeting with the Kazakh minister and with the participation of telecommunications operator Kazakhtelecom the sides discussed the important role of projects TASIM / EuraCA in developing telecommunications infrastructure and the Internet in the region. 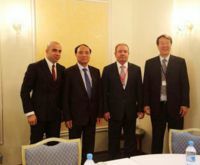 The sides also agreed to start laying fiber-optic cable lines under the Caspian Sea with the joint participation of Azerbaijan and telecommunications operator Kazakhtelecom in September. Specialists from Kazakh side will arrive in Baku to discuss the technical and financial aspects of the project in August. Also, Ali Abbasov held a bilateral meeting with his Russian counterpart. The sides conducted final negotiations on the draft Memorandum of Understanding to reduce tariffs for international roaming services between the Ministry of Communications and High Technologies and mobile operators of Azerbaijan and the Ministry of Telecom and Mass Communications and mobile operators of the Russian Federation, the signing of which is planned to be held within the framework of the International Exhibition and Conference BakuTel 2014, and Russian operators stressed their interest in implementation of projects TASIM / EuraCA. During the visit bilateral meetings were also held with the heads of administrations from Belarus and Tajikistan, as well as candidates elected for bodies of the ITU Plenipotentiary Conference to be held in the South Korean city of Busan, in particular representatives of China, the UK, South Korea, Turkey, Russia, Canada, Nigeria, and was mutually agreed to support the candidacy of Azerbaijan for the Board of the ITU, which is the main body of the organization. Moreover, the sides agreed that these countries will be represented by national pavilions and exhibit their products and services at the International Conference and Exhibition BakuTel 2014 December on 2-5.